HAMPDEN -- The Winthrop field hockey players and coaches officially call it simply, "The V Play." If it keeps working this well, they'll starting calling it The Best Play Ever. 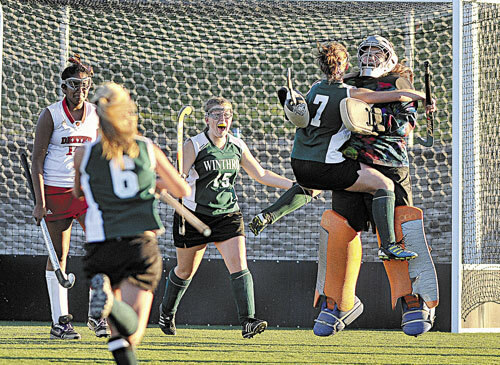 HAMPDEN — The Winthrop field hockey players and coaches officially call it simply, “The V Play.” If it keeps working this well, they’ll starting calling it The Best Play Ever. Winthrop put in the penalty corner play before its semifinal win over Stearns, then used the play again in the Eastern C regional final against top-ranked Dexter. Lauren Kaiser scored off a pass from Shauna Carlson and Winthrop earned a 1-0 victory at the Weatherbee Complex. No. 2 Winthrop (15-1-1) will now face Mountain Valley Conference rival Lisbon in the Class C state final on Saturday at the University of Maine. The time for the game has not been determined. Dexter finished at 15-2. For Winthrop coach Sharon Coulton, it was not only her second straight regional title, but her 300th career victory. Winthrop scored its goal on its second corner of the game with 16 minutes, 18 seconds left in the half. On the play, which was designed by assistant coach Jess Merrill, Carlson received the insertion pass at the top of the circle, with Kaiser on her left and Mary Claire Blanchard on her right. Carslon went left to Kaiser, who drilled a shot inside the left post for the 1-0 lead. That lead held the rest of the half, but after the break the Ramblers saw a faster Dexter team. The Tigers held Winthrop without a shot or a penalty corner in the second half. “I was definitely scared, because I knew that they were going to come out very hot in the second half,” Kaiser said. Winthrop was still able to keep Dexter’s pressure from being game-changing. Especially in the final minutes, the Ramblers kept four defenders behind midfield even when they had the ball in the circle, and they used up valuable time by keeping possession while playing 6-on-11 on that side of the field. The Tigers had four penalty corners in the final five minutes, the last coming as time ran out. Dexter’s shot went wide, and the game was over.